18 Sep, 2018 in art / business / creativity / daily practice / goals / income / leadership / marketing / planning / podcast-episode / productivity / sales / systems / time management by Minette Riordan, Ph.D.
We’re always playing with that tension between structure and flow, so that we can bring the best of our findings to you – our beloved, creative community. Today we’re sharing how you can manage your workflow to improve creative productivity. How do we allow for more creative breakthroughs to emerge? Think of it literally as work flowing from one stage to the next, whether that’s through a colleague, tool, or another process. You can execute a full workflow alone (like writing, editing and publishing a blog post), or it can involve multiple people (like invoicing a client). Your physical space and how you set it up for ease of flow – like in an art studio, wood shop, writing desk, or other manufacturing space. Your creative process – how do you begin? You might think it’s different every time but if you start tracking, you will surprise yourself as you probably have internal processes you aren’t even conscious of. How can being more conscious make you more productive? Group projects with multiple players – need a more formal and often visual, automated representation of workflow to show stages of a project, who is responsible for what and the order of the work. This could be a diagram or a checklist. Creative projects with many steps/tasks – use a spreadsheet, bullet journal or app like Trello, Asana or other to be able to track your projects and your progress. This not only improves productivity but helps you to manage your time, and predict the amount of time needed for tasks and create invoices based on time. To discover other juicy explorations like the ones listed below, check out the full podcast. See you on YouTube! Minette Riordan: My to do list is miles long. Brad Dobson: Hi there I’m Brad. Minette Riordan: We believe in more play, more fun and more profit. Join us as we explore the interplay between structure and flow so that we can bring more grace and ease to your creative business. Brad Dobson: Hi and welcome to episode 118 of Structure and Flow, The Productivity Podcast for creative entrepreneurs. Minette Riordan: Hey everybody I’m Dr. Minette Riordan, I’m flow. Brad Dobson: I’m structure, I’m Brad. Minette Riordan: It’s so awesome to be back with episode 118, hopefully you listened last week to our conversation that we had with Shannon about content marketing and how to really improve your productivity based on not doing all the things. Brad Dobson: That’s the truth. Minette Riordan: And we’re going to continue that conversation today and we’re going to talk about work flow. Like what the heck does workflow mean? Brad Dobson: That sounds way too much like structure, Minette. Minette Riordan: It’s a little bit different than structure, but I think it lends itself to improving structure in our business. So we’re going to talk about how to design a workflow, what are different kinds of workflows and who knows where the conversation might take us. Minette Riordan: We’re a little punchy because we just spent what, like three hours doing our planning for the rest of the year. Brad Dobson: We planned like little busy beavers. Minette Riordan: We did, and our heads are kind of full, but you know what? We actually started creating so visual examples for workflows for all the different areas of our business that we’re working on, so this is kind of really timely. Again, I know that we said that last time as well but it’s always true. Brad Dobson: We’re more productive when we’re planning well and we’re more productive with good workflows. Cool. You want to start with a quote, Minette? Minette Riordan: Sure. So theory is splendid but until put into practice it is valueless, said James Cash Penny the founder of JC Penney department stores. Brad Dobson: So it’s all talk until you actually start walking the walk. Minette Riordan: It’s all talk until you get into action, right? So I mean you see this certainly in the sciences, you see it in weight loss and fitness programs. And we talk a lot about how many incredible analogies there are between training and fitness and well ness and other areas of life and productivity in your business. Minette Riordan: So we can talk about the value of structure all day long and what we know to be true about working with creatives over the last five years, is that the more visual we can make it, the more successful we’re going to be. So the cool thing about creating workflow is that you can do it with my favorite, crayons, markers, sticky notes. This doesn’t have to be about technology, although it can be. Brad Dobson: I want to get how you got workflow from this quote. That’s what I didn’t get. It’s not quite flowing for me. Am I going to put you on the spot? Minette Riordan: No, you’re not going to put me on the spot because there weren’t any quotes about workflow. There were all kinds of great quotes about efficiency and there’s always great quotes about success and time management, but on this show we talk a lot about structure and flow and nothing we say on this show will do you any good unless you actually implement it. So from our own perspective, we talk about planning and planning in theory is great. So this morning we model what that look like to put our theory into practice, which was to put plans and workflows around. In fact, we even talked about over lunch, how can we even take our planning even deeper into better workflow by theming our days as Ellen Brown shared a few episodes back in his awesome interview that we did. But so for me, everything we talk about is useful and you got to take what feels useful to you and actually put it into action to get the real value out of this as a workflow. Brad Dobson: Gotcha. We do that for this podcast. Certainly there’s a workflow before the podcast starts and a whole workflow after the podcast. After we’re done recording there’s a whole bunch of stuff around that. Minette Riordan: There is, and so another question that people might be having as they’re listening to this, and as I was planning the content before I sent it off to you for you to add your ideas is what’s the difference between a workflow or work flows and a system? Let me put you on the spot now. Minette Riordan: But a system is a process, a checklist and some of that applies to workflow as well. But I think there’s this overarching idea of workflow that is really important to consider, which is why, and I could have used this as the quote, but it’s really the definition of workflow. I found a great article when I was doing my research by a guy named Benjamin Brandall. Minette Riordan: Sure. It was an awesome article. And he said that workflows are the way people get work done. Duh, right? It sounds like if you go read the Wikipedia entry on workflows, like it just will make your head twist into space and it’s meaningless. Brad Dobson: Not a very creative looking thing. Minette Riordan: It was not a creative look at workflow. So workflows are the way that people get work done. And they can be illustrated as series of steps that need to be completed sequentially in a diagram or checklist. So a workflow is actually, I would say, part of a systemized process for planning and getting things done. Brad Dobson: It’s interesting when you said the word there, it triggered something in my mind, is that it’s the combination of work and flow, which does make it a little different than a system. It’s your work in action and those steps flowing together. Minette Riordan: And so for me also a system can be something as simple as the checklist we created for the podcast and how we get the podcast done, but the workflow is the sequencing and priorities of how the whole process happens. So we actually need to understand the workflow first in order to get to then maybe those internal systems that help us get our tasks done efficiently. Brad Dobson: I think traditionally there’s a concept of a workflow producing something at the end, something that you actually output, a unit of work. Whether that’s a chapter of a book or a book itself, in our case, a podcast episode that is then consumed by y’all. Minette Riordan: Said the Canadian. Brad Dobson: So like the art that’s behind us. There was a workflow involved in that. It involves going to Michaels and standing in line to buy a canvas. Minette Riordan: It’s always a long line up at Michaels. Minette Riordan: Not that one. Brad Dobson: That was not traced. All that type of stuff, as well as the flow of where the desk was set up, where your easel was set up. Minette Riordan: Yes, and you’re getting ahead of the game here with our different types of workflows. Brad Dobson: Sure. But it still ended up with an end result. Minette Riordan: Yeah, absolutely. So you want to think of workflow literally as work flowing, one stage to the next. Whether that’s through a colleague, because workflows can often involve entire teams, whether it’s flowing through a tool or other processes. And you can execute a full workflow alone all by yourself as a solo entrepreneur like writing, editing, publishing a blog post, or it can involve multiple people on a team. For example, in the creative industries, when you have five people are working on a creative project or in a law firm where you have multiple people working on a project, everybody has to contribute their time in order to create an invoice. Minette Riordan: So there’s a lot of different examples of how workflow impacts. But I was really curious with your systems and process background in software, did you guys draw things out using workflows when it came to planning for software? Brad Dobson: Oh, let’s see. I think probably even more complex than that. Minette Riordan: More complex than that. So what’s the next level? Brad Dobson: Well, there’s just so many steps involved in stuff. But a lot of times I think we lost track of what the workflow was. So there wasn’t someone standing back saying, “Oh gosh, that developer is spending an extra two hours at this step of the workflow that could be completely automated. Or we could spend a thousand dollars here and have 90% of our developers save 15 minutes a day, which translates into millions of dollars or whatever, that thing. So, from a software development perspective, I think we’re missing out there, where what you really wanted, especially for team efficiency was to actually have someone look at what people are doing in terms of their workflow. And you can do this at a micro level, at your own level as a solopreneur. Minette Riordan: I know. You’re giving away all my steps here. Brad Dobson: Well, you just asked the question. Minette Riordan: Yeah, it’s a great answer to the question, but part of having workflows in place is checking them for productivity and to be able to assess how much time it’s taking you to get things done. Were you losing a lot of your time? Minette Riordan: Were you working outside the flow? Brad Dobson: If you let your art brushes dry overnight, how well would your workflow be working for you? Minette Riordan: Since our children have done that [crosstalk 00:10:21] I know exactly how long it would take. So let’s talk about what the different types of workflow are that people can consider implementing in order to improve their productivity. Minette Riordan: You want to start? Brad Dobson: Yeah. We can talk about physical space, what it is you have set up to do your work. Some of you are keyboarding, some of you are physically creating different works of art. You might be a writer. What is the physical space that enables your workflow? And there may be things in the physical space that are part of your workflow, your tools. So your tools might be a mole skin notebook and an IBM Selectric typewriter. They might be a specific set of paints and canvases. They might be heavy duty videography tools. There’s definitely workflow involved in videography. Brad Dobson: You don’t assemble before you cut? Minette Riordan: Where you’re just chopping away and then it doesn’t really matter. But thinking about the physical steps and things that work in a wood shop or when I was growing up, my dad and my step dad owned a company that made a carnival rides especially merry-go-rounds. Brad Dobson: My dad is a carnie if you didn’t know that. Brad Dobson: And the paint. Minette Riordan: And to paint the whole horse paint, I only had to do the fun decorative painting part. So it’s knowing that there was a very clear workflow and many people involved in the process of creating one merry-go-round horse even before it became part of the whole machine of a merry-go-round itself. So it’s an example of thinking creatively about your current workspace and could you implement better workflow? So for us, part of our workflow, making sure things are charged up and ready to go. Making sure that we have coffee and water ready to go, that when we sit down to work, that the right notebook with our to do list is beside us. So looking even at how you’ve organized your physical space so that it becomes another part of routines. You know, we talked about morning routines and about how do you set yourself up for success? And part of that is making it easy to step into your own workflow from a physical perspective. Brad Dobson: Your brushes aren’t dried with paint on them then? Minette Riordan: They better not be. Brad Dobson: It’s such a huge deal to be able to step into a workflow that is unencumbered by clutter or dull tools. The term dull there could apply to anything. Minette Riordan: [crosstalk 00:13:49] without coffee is a very dull tool. Brad Dobson: It could be the tool between your ears, it could be all those things. Brad Dobson: Kitchens are a great example of workflow. Minette Riordan: Kitchens are a great example of workflow. Brad Dobson: Watch some guys in a professional kitchen. Minette Riordan: Yeah, it’s amazing. And teams working together and how the people flow. It’s amazing to think about. So we want to move from physical space to thinking and the analogy of the paint brushes with dried paint on them. It’s a great example. But what is your creative process? This is also a workflow for anybody doing any kind of creative work. Brad mentioned writing, we mentioned woodworking, we mentioned machinery. But this is true in music, it’s true in programming. What is your productive creative workflow? And I recently took a really fun class on creating a deck of Oracle cards and if you follow me at Art Journal Club on Instagram, you can see a few of them and I posted them on Facebook in our Productivity for Creative Business Owners Facebook group. But what I learned from the class was it a better workflow to make the whole process go faster and it felt kind of frustrating at first. Minette Riordan: We were supposed to have piles of different colors from our stash. So I had piles of yellow paper, piles of red paper, piles of pink paper. So all these, I did my organization upfront. I had piles of images and symbols and piles of words that I might want to use. So putting in the time up front so that when it came time to sit down and get work done, the workflow process was already in progress. So think about how can you do that. Our Monday motivation email series is another example where I have a whole collection of images and I allow the images to inspire me, but I have a very clear workflow process that starts with the image, then with me writing, then it goes from me to our amazing VA, and she does the actual implementation and pushing out of the emails, the blog post, the social media. So there’s a very clear workflow and very clear examples of who’s responsible for what. Brad Dobson: Right. Good stuff. Creative workflow. I have to think about that one some more. Minette Riordan: Well, think about creative processes for programming, like you do noodling on paper first to think about your ideas. Like there’s a lot of workflow pieces that come into play before you ever actually start programming or developing a new piece of software. Brad Dobson: That’s true. Lots of design, lots of stuff in my head I guess. Brad Dobson: But there’s definitely a flow to that. Minette Riordan: And if you can become really conscious, you might think that, “Oh I don’t have a process for my creativity”, or, “I only write when I feel like it. I only program when I feel like it. I only paint when I feel like it.” Well, the most successful writers, and the most successful artists, and the most successful people in business will tell you, you cannot wait for inspiration to strike. You actually have to do the prep work so that inspiration shows up when you have the time and when you’re ready. So understanding your own creative process, and you probably have one unconsciously. Even if you aren’t aware of your steps, you probably have already doing the same things. Minette Riordan: I found this great picture that I loved, maybe it was WHR, of this rider that had this little rider’s hat, like totally old school on basically like a lazy Susan. It was a little tiny that he could personally, it was light enough, by himself he would turn it all day to catch the sun so that he had as much light as possible. Talk about maximizing his workflow in a super creative way. But again, that process is he went into his hut, he wrote for so many hours, he came out for lunch, took a walk for a couple of hours, and then maybe would go back and write. So his creative process became very structured in a sense so that he was ready for inspiration, and even if he got into the writers hut, and he wrote a bunch of crappy stuff, he created the habit of writing. So workflow can increase I think, those moments of inspiration and increase productivity by just getting you to show up in your workspace every day. Brad Dobson: That’s cool. Yeah. I recently listened to a Joe Rogan podcast episode with Chuck Palahniuk, the author of fight club. Pretty well known, but Joe really gets in and picks into his brain about his process for writing, and there’s just some fantastic insights into how he puts together a book. He has his journal with him all the time, and takes notes and that’s what generates a book. He doesn’t do any keyboarding for a couple of years. He’s collecting things in this notebook, collecting stories. And then the ideas, those germinate ideas and they come together into a book. It’s pretty neat stuff. Minette Riordan: It is neat. And if you were to go and simply google the word workflow, what you get is a whole bunch of pictures and diagrams of all different kinds, and people using them, especially in corporate settings and being super visual. I think those kinds of diagrams are really impactful, especially if you’re working on group projects or with multiple players that need a more formal visual way and an automated way of moving through workflow. And like Brad was saying, where you can be checking in on how much time are people spending on different steps and stages of the workflow. 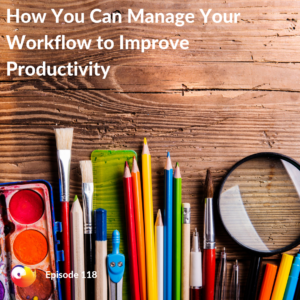 So I would invite you to get really curious about how could you automate and/or create visual diagrams of workflow in the different aspects of your business to improve productivity. Brad Dobson: Yeah. Anything like that wherein it gives you an opportunity to then have this reference point in going back to what we talked about before in terms of improving the workflow. You have that reference point and if you see yourself in the same step of the workflow all the time when you don’t think you should be, maybe there’s an opportunity to improve that part of the workflow. Minette Riordan: Or if it’s a repeatable process and you’re using the same workflow for all your different projects and you’re getting stuck at the same place every single time, you get to look at why. But I thought maybe you could talk about ONTRAPORT’s campaign builder as a great example of a visual example of workflow and how we use that to see in our marketing what’s working and where we need to improve. Brad Dobson: Yeah. It’s kind of the same and a little bit of the reverse of that. Their campaign builder gives you an opportunity to show how people that become aware of you and are interested in your email newsletter or your Facebook updates or things like that. How they can receive communications from you and how you can market to them, but it’s on a visual scale. So you can drag and drop icons around and see the steps that people are going to go through when they say that they’re interested in you. But it’s a great way to be able to look at that and in fact with there’s built in statistics in terms of how long people spend at each part of that flow. So to a certain extent it is a workflow, except it’s for clients that are coming in through your system. Minette Riordan: Well, for me it works on a couple of different levels and I realize I should have clarified ONTRAPORT, if you’ve never heard it before. It is the company and the tool that we use for all of our CRM, our customer relationship management as well as our email marketing and a lot of other digital marketing landing pages, sales pages, opt-in opportunities. All that is done through this amazing local company from here in Santa Barbara called ONTRAPORT that we’re big fans of. What I like about the campaign builder is that it helps me as a very visual creative person understand the thought process that people go through and I actually know what emails to create in a campaign by following this visual campaign builder. So brad can go in and do the visual at the campaign. So for example, someone opts into a lead magnet, for example, they take the unique productivity style quiz that we’re always telling you guys about. Minette Riordan: And they take the quiz but they don’t actually open the email with the results which happens all the time. So then it tells us, “Oops, they didn’t click on that email, we need to bug them to make sure that they get what they ask for.” And if they did open the email, then we say, “Great. So you’re a commander, that’s awesome. Here’s what else you need to know about being a commander.” And we can really start to build a relationship with them. Or it’s a sales page and somebody goes to the sales page but they don’t buy. We know that, and we can say, “Hey, you didn’t buy, you still got a chance.” Or, “Hey, you didn’t buy, why not? We’d really love your feedback.” So it gives you the chance to really understand not only all the emails that you need to create, but what that thought process is of creating an online communication experience that really builds community engagement. And our daughter just walked in the door. You probably maybe heard her shouting in the background saying it smells really good because green chilies smells really good. Brad Dobson: Keep talking about the next one. Minette Riordan: Keep talking about the next one, and he’s going to go tell her daughter that we’re recording a podcast. Talk about being raw and like this is our real life and what happens every day. So the fourth type of workflow that we wanted to share was about creative projects. And I recently took a wonderful, wonderful, course from Creative Live, I love Creative Live, with a brilliant designer named Lisa Congdon. And it was specifically about time management, productivity and workflow for people in the creative industry. So she’s an illustrator by trade. She’s worked on some amazing projects, and she often will have three, four, five big projects all going on at the same time. So in that context, workflow takes on a completely different meaning than any of the ones that we’ve shared before and we’ve talked with this about our clients as well, is having some type of place where you’re storing all of these projects, I can talk, where you’re storing your projects, where you can keep track of the workflow, where you can keep track of the process, the sequence, the tasks. Where things are getting marked off when they’re getting done, and then when a project is complete, it’s removed from the workflow. Minette Riordan: One of the first graphic designers I ever worked with, she did this visually just using a whiteboard. She had this awesome system on her whiteboard where she had like three columns and so she had projects that were brand new and just beginning, projects that were waiting for revision and projects that were completed and needed to be invoiced. So she had this very clear, super simple workflow and she just moved people across the board. Lisa Congdon uses spreadsheet, and she organized it by big projects, medium projects and small projects so that she could manage her time effectively. And she knew if there was a bigger project that needed more chunks of time then that could get scheduled into her calendar as well. Minette Riordan: Time management perspective. Brad Dobson: Yeah, yeah. I get that. Sure. Minette Riordan: And being able to really understand how much time projects would take. And for her it meant that if all of a sudden she found herself with 15 minutes between phone calls, she could grab a small task from her list. So it served dual purposes for her. Brad Dobson: Gotcha, Gotcha. Gotcha. Minette Riordan: Yeah, that’s a great clarity. And then the other great one actually that’s beautifully designed for workflow if you are still an analog fan and love pen and paper, is the bullet journal method. Bullet journaling is super popular. It was started actually by a student and really just took off in the art journaling communities because people love creating really fun pages. But the concept is that using a pen and paper most often a moleskin journal, that you create rolling to do lists. And Lisa Congdon also talked about this from a workflow perspective of having rolling to do list, so nothing gets lost. So that on a day to day basis, if you haven’t completed a task, you don’t have one long massive to do list. Minette Riordan: You guys have heard us talk about our big six. We’re big fans of minimizing your to do list, but you still need to have it be rolling so that you’re not losing track of tasks. So when you get into a rhythm in your workflow, you’ll be able to better assess how much time things take. You’ll be able to better sequence the steps involved in a process as well. I think this is a big part of productivity, is learning how to prioritize your tasks and really what I love, I think about the visual aspect of the workflow, is being able to see the steps out in front of you and not skip ahead three steps, which is, I can do that, right? Minette Riordan: It would be awesome to just go from blank canvas to this painting, but this was five days, six days of painting and coming back and painting and adding and detracting, and I had to do the background first. I couldn’t do the background last because then it would have blurred all around the edges. So it’s really starting to look at what do I need to do first, what do I need to do a second? And it forces you to think through the sequencing before you start the project. And it sounds like that takes time, but in the end it saves you so much time to think through the sequencing of the steps before you begin. Minette Riordan: When we were recording the podcast, there were plenty of episodes where we showed up with a few sticky notes and we didn’t really think through the conversation. So we’ve gotten a lot better in 118 episodes of really being more thoughtful in the way that we structure the content. So there’s a content decision there to make as well. Minette Riordan: He’s talking to me when he said that. Minette Riordan: That’s pretty fast. Fast and furious analogy. Brad Dobson: And start being creative without worrying about the tools, without worrying about the workflow and all of those things. And that’s really what you want, right? You want to free yourself up to be your creative best by having this workflow in place and being more productive because of that, meaning you get to create more of the work that you want to and you were put on this earth to create. Minette Riordan: Yeah. And it’s about simplicity. And again, it’s back to this, if we think about the amount of creative inspiration that goes into the work that we do, and this is true for almost any industry. I don’t know that any industry doesn’t require creative inspiration at multiple points along the process. The more prepared you are ahead of time, actually the more creative you are. We talked about the principle of creative constraints. Workflow creates that constraint organically for you so that you can show up, ready to go and ready to get to work and not wasting as much time. And I’m a big fan of working smart and a saving as much time as possible because the faster that I get my work done, the more time I get to paint. Brad Dobson: Cool stuff. What have we got on for next week? Minette Riordan: What have we got on for next week? We’re going to talk about how mindfulness helps productivity. In fact, over the next four or five episodes, we’re going to be looking at other areas of our life that impact productivity in our business. More starting with mindfulness. We’re also going to talk about diet and exercise or even have a great conversation coming up on gamification and how you can gamify your productivity to inspire you and celebrate getting more done. Reward yourself for getting more done. But mindfulness is what we’re going to be talking about last time along with the review of a great book we just read called Mind is Time. Minette Riordan: And then don’t forget, go take that quiz. It’s the unique productivity style quiz. No two people do productivity the same, so make sure you’re creating a productivity blueprint that is ideal for your personality. You can take that at pathtoprofitacademy.com/upsquiz. It’ll be in the show notes as well, and we’ll see you guys next week. Brad Dobson: Thanks for listening to Structure and Flow, the productivity podcasts for creative entrepreneurs. To find out more about this episode and others go to pathtoprofit academy.com, then click on the podcast link. ← [Monday Motivation] Are you afraid to fail?